Whether we like it or not, winter weather is here to stay for a couple of months. During the cold winter months, I go into a little hibernation mode with my family so I’m always thinking of new ways to play inside. We’ve started updating our basement into the ultimate play area with a slide, art studio and home entertainment area but we always need new fun ideas to keep things interesting. To make sure we don’t fall into that winter blues rut, I’ve put together a list of 50 ideas for indoor family fun that the entire family will enjoy. 1. Family Movie Night: Print out some free movie night printables and create your own home theatre with tickets, a selection of movies and snacks – don’t forget the chocolate! 2. Indoor Camping Adventure: Set up a tent in the basement and spend the night camping indoors. You can use pillows with orange & yellow tissue paper to make a fake fire pit. Use toy fishing rods with magnetic fish to go fishing off the back of the couch. Craving s’mores on your camping adventure? 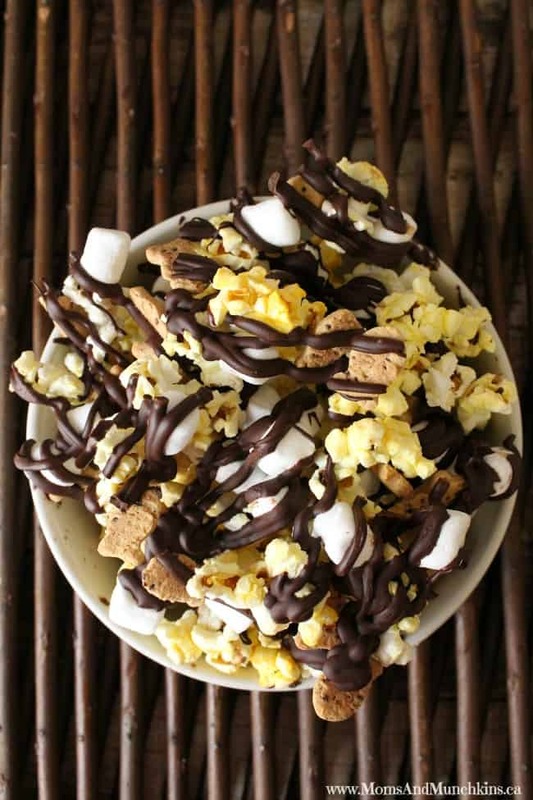 Try this Campfire Popcorn Treat! Everything is better with chocolate! 3. Dance Party: Put on your favourite music and have a silly dance party. 4. Karaoke: Set up your karaoke machine or just put on your favourite musical movie and sing along. 5. Dress Up: Play dress up with old costumes around the house (even your Halloween costumes), host a fashion show and take pictures for your family album. 6. Plan a Parade: Bring in the wagon from the garage, decorate it with tissue paper, streamers and balloons and host a parade with your stuffed animals. 7. Create A New Play Space: Brainstorm some new ideas for your play room and tackle a little renovation project together. 8. Balloon Games: You can’t play baseball in the house but you may be able to play some of your favourite sports inside if you use balloons! Football, soccer, baseball, volleyball, hockey – these can all turn into fun balloon games. 9. Charades: Get ready to show your silly side in a game of charades. Here on Moms & Munchkins you’ll find free printable charades. 10. Indoor Scavenger Hunt: It’s easy to plan a scavenger hunt right in your own home! You could search for particular shapes, hidden stuffed animals and more. 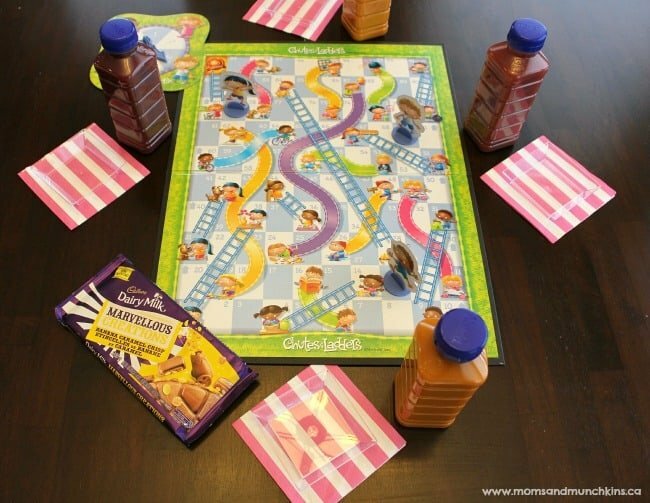 We have free printable scavenger hunt games here on Moms & Munchkins to help you get started. 11. Prize Wheel: Do you play a lot of games at home as a family? Why not try creating your own fun spinning prize wheel. It’s a fun craft project that you can use for special rewards, to cheer someone up on a bad day or as a prize reward for game night. 12. 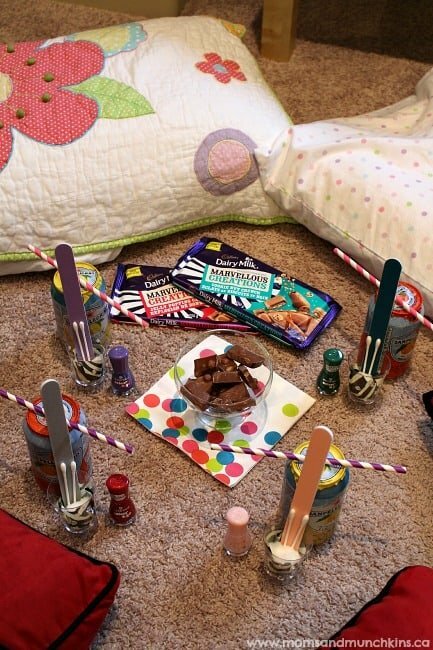 Hosting a Family Slumber Party: Turn your basement into the ultimate slumber party area with sleeping bags, pillows, games, manicure sets, movies, snacks and anything else you need for a great party. 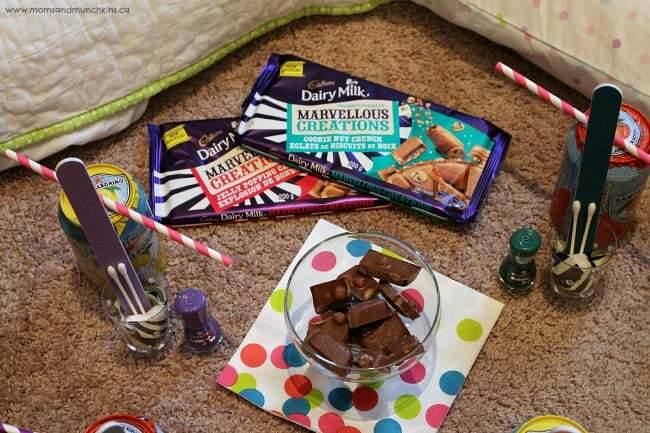 Cadbury Dairy Milk Marvellous Creations are perfect for sharing while playing slumber party games. 13. Truth or Dare: This family-friendly Truth or Dare game will leave the whole family laughing. 14. Family Trivia Game: Make up some trivia game cards and have each family member write some little-known facts about themselves or other family members to create a trivia game about your own family. 15. Indoor Obstacle Course: Create your own indoor obstacle course with boxes as tunnels, pillows to roll over, streamer paper “rope” to crawl under and more! 16. Paper Bag Puppets: Use some of your craft supplies to make paper bag puppets and then have a puppet show. 17. Create a Comic Book: You’ll need paper, pencils and your imagination to create your own comic book. This can be a winter project and you can work on a page or two at a time. 18. Get Cooking: Make up a new recipe together – perhaps a new flavour of cupcakes with Cadbury Dairy Milk Marvellous Creations on top. 19. 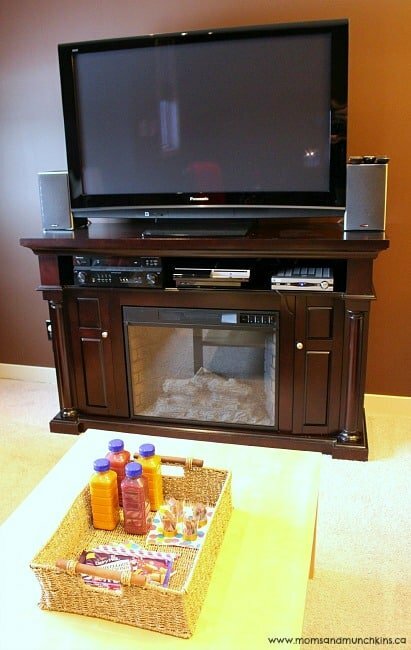 Make Your Own Commercials: Use your home video camera to make up silly commercials for items around your home. 20. Science Experiments: Explore the fun side of science while conducting some safe science experiments in the kitchen. 21. Create Your Own Dollhouse: Using old boxes, create your own dollhouse. What sort of doll furniture can you make with supplies around your home? 22. Magic Tricks: Learn a few magic tricks to show your friends. 23. Cozy Story Night: Get cozy by the fireplace and read stories together. 24. Make Musical Instruments: With old boxes, cans, bottles and elastic bands, make some homemade instruments and host a family concert. 25. Family Game Night: Grab a few family favourites along with a few new games for a night of games and laughter. 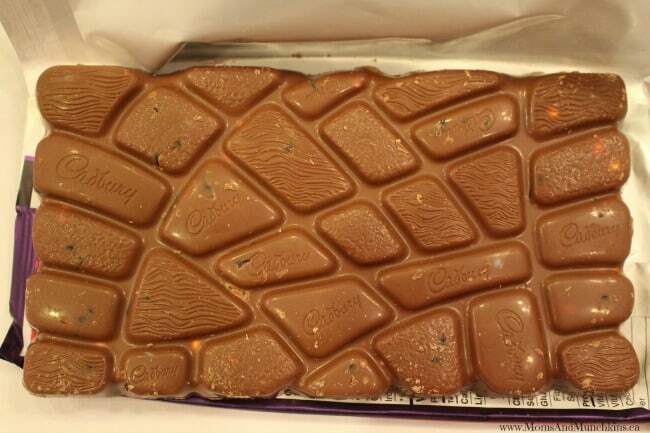 Share delicious chocolate like Cadbury Dairy Milk Marvellous Creations as a treat. 26. Family Awards: Create some homemade trophies and host a family awards show. Who will win Best Dressed? How about Best Dance? Most Original Talent? The possibilities for awards here are endless! 27. 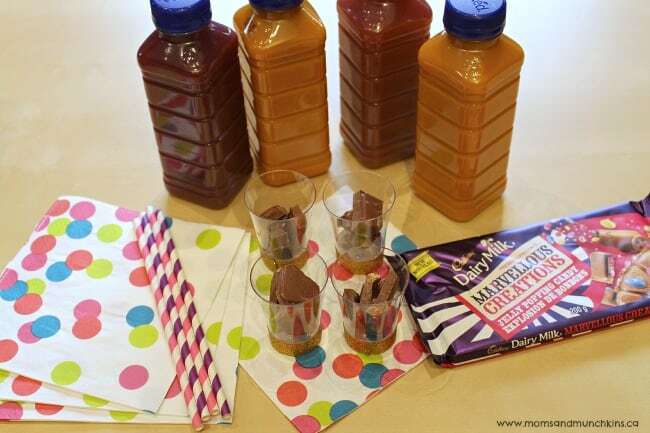 Indoor Picnic: Make some of your favourite picnic foods, set up a picnic blanket on the floor and have an indoor picnic. Don’t forget dessert! 28. Make Your Own Snack Bowls: Using special markers designed for writing on glass or plastic, personalize your own snack bowls for movie night. 29. Scrapbooking: Create a scrapbook with pictures and souvenirs from your last family vacation. 30. Indoor Bowling: Using empty plastic bottles, create your own indoor bowling game. You can even use painter’s tape on the floor to create lanes. 31. Making Cards: Create special cards to mail to other family members. This can be for birthdays, thank you cards, thinking of you cards, or any other special reason. 32. Memory Card Game: Using cardstock paper, scissors and stickers, create your own memory card game. 33. Origami: Learn how to make origami creatures then create a little garden for them. 34. Hawaiian Luau: Bring the sunshine indoors by planning a Hawaiian Luau with traditional recipes, hula dancing and making your own leis. 35. Build Your Own Airport: Build your own mini airport and runway for paper planes. 36. Countdown Calendar: Do you have a special vacation coming up? How about a holiday or birthday? Create a fun countdown calendar to help count the days until your special day! 37. Create Masks: Using paper plates, scissors, markers and ribbon, create silly masks. 38. Movie Posters: Draw and colour a movie poster for one of your favourite movies. 39. Smoothie Bar: Set up your own smoothie bar with a menu of options, a buffet of fruit, fancy cups, a blender and ice. 40. Fondue Feast: Create a fondue feast with melted cheese, breads and meats. 41. Sock Puppets: Take all those lonely socks that miss their partners and turn them into silly sock puppets. 42. Flashlight Games: Turn out the lights, grab your flashlight and play flashlight games like shadow puppets. 43. Baking Cookies: Bake a large batch of cookies to donate to a local bake sale or shelter. 44. Breakfast in Bed: Plan a delicious breakfast in bed where everyone can gather in one room, eat breakfast in bed and watch cartoons. We have a free Room Service printable for this! 45. Power Outage Activity Box: Create a box of activity ideas for your next power outage. 46. Glow In The Dark Games: Grab some glow sticks, turn out the lights and play some glow in the dark games. 47. Create a Family Tree: Teach your children more about their relatives by making a family tree. 48. Awards Show Party: Plan a family party for the next family-friendly awards show on TV. 49. Mini Tailgate Party: Grab a few of your toy trucks and host your own mini tailgate party inside with burgers, fries and football. 50. Ice Cream Social: Set up an ice cream sundae buffet with some of your favourite ice creams and toppings. 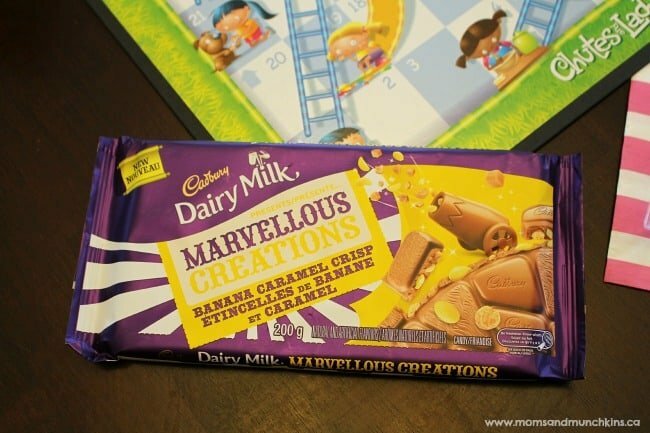 The 200g Cadbury Dairy Milk Marvellous Creations are made for sharing and perfect for family fun night. The 3 different varieties and the unique design means you never know what you’ll get in each bite. 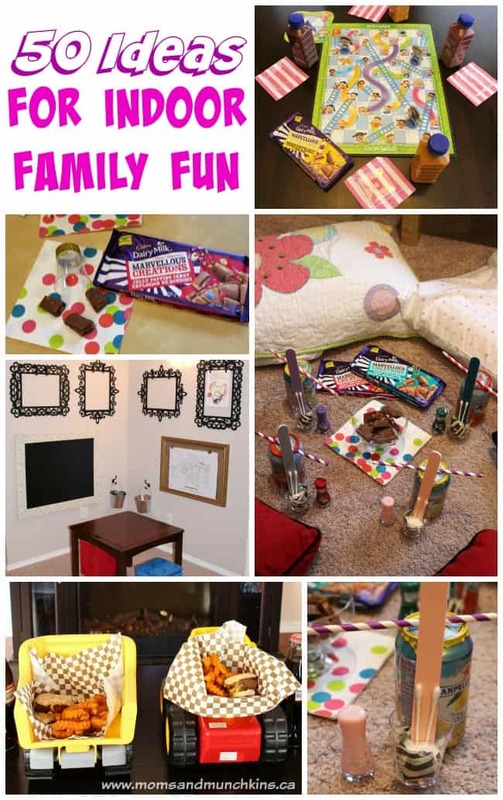 Can’t wait for family fun night to try one of these delicious candy bars? They come in single serving sizes as well. There you have it – 50 indoor family fun ideas for beating the cabin fever during this long winter season. I hope your winter is filled with warm snuggles and lots of quality time with your family.